For most of my boating life, combining the terms “luxury” and “pontoon,” to describe a boat would not have happened. Having matured and become somewhat less mobile, this describes my ideal vessel: a true 4-door sedan, with entry doors fore, aft and either side for easy access no matter where you dock. The door/gates have a simple lift/lock mechanism for both open and closed positions. 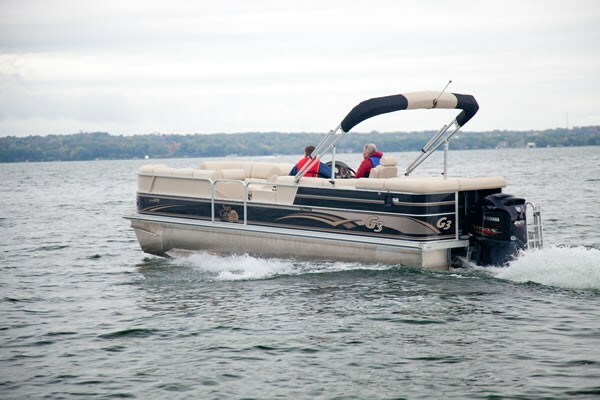 This 25 footer, designated EL for Elite Luxury, really is luxurious for a pontoon boat. The buttery-soft, cream-coloured, pillowed, vinyl interior would not be out of place in a 50’ motor yacht. Forward, you’ll find two molded chaise lounges, or seating for six with under seat storage. To keep these storage areas dry, a rain drain channel surrounding each cushion, channels any water away. Between these lounges, under the stain-resistant, carpeted floor is a massive storage locker. How does this happen in a pontoon boat? Compliments of the center log in this 3-log boat. Portside is a refreshment centre with sink and cutting board with storage under. Opposite is the fiberglass centre helm station with even more storage. An “L” shaped lounge completes the seating, and 14 cup holders are spread throughout the seating area. A huge sun pad aft raises, to expose a retractable, canvas change room. Through the aft door starboard is access to the 4-step boarding ladder, supplying easy access for the swimmers or skiers on board. The standard booted bimini stores out of the way above this area and a matching mooring cover is standard equipment. An ABS table with another 4 cup holders has two base locations, one forward and one aft. Sitting at the dock, this boat has features that make it stand out. The finish is high-gloss black with attractive graphics. Navigation and docking lights are flush mounted. 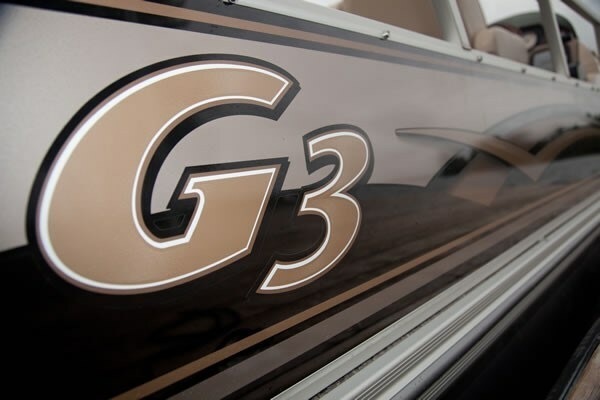 The hull “logs” are not round, as is usual, but what G3 call “U” shaped, with flat tops, which make mounting to the hull, through-bolted and less complicated. The logs have double plated nose cones with .125 spray deflectors for durability and dry ride and are filled with closed-cell foam flotation. This is a safety feature should a hull become ruptured, but it also results in very quiet running. Sitting in the luxurious, fully adjustable helm seat, one observes standard speedo, tach, trim and fuel gauges. Also standard is molded windshield, Sony stereo with MP3/USB port and upgraded speakers, flush mounted Garmin 430S GPS and Yamaha Deluxe Binnacle controls. 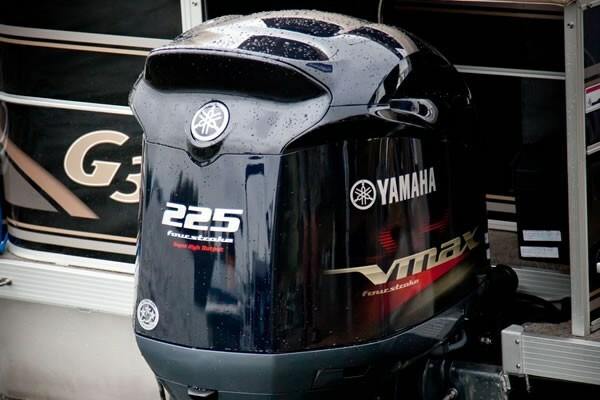 The big Yamaha starts instantly, running so quietly that it’s tough to tell it really is running. Leaving the dock, the electric/hydraulic steering gives effortless control. Acceleration is brisk to say the least; with the ample horsepower available, this boat runs mid 40’s MPH with no noise or effort. It handled the modest 6” chop on Lake Couchiching with ease and I’ve not been aboard a quieter pontoon boat. With standard ski tow bar, skiing or boarding would be simple and it goes fast enough for anyone who still barefoot skis. 3200-RPM results in mid 20’s MPH for a great cruise speed. I would expect one would get adequate performance from the standard 150 HP engine, but his thing really runs strongly. Moving from side to side at speed or at rest has no effect on stability. As one might expect riding on 3 X 25’ logs, it tracks straight and true. 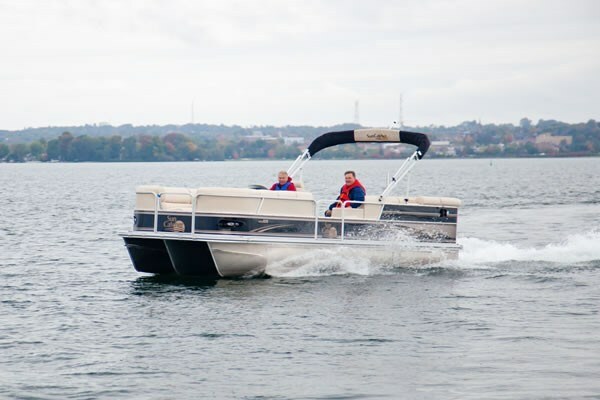 This boat has over 200 square feet of usable space to do all the things possible on any pontoon vessel, but goes away beyond the norm. If you’re looking for a quiet way to enjoy the water with family and friends, on a boat that’s sooo easy to get around on, and you want to move above the norm with some luxury, have a look at this one. It’s not cheap, but it sure is a step above!